Total Workshop search results: 105. Displaying Page 1 of your woodworking search phrase CLOCK PATTERN. Our Door Goose is designed as a Door Ornament and a name, street number, the word Welcome, etc. may be painted on the body. It may also be used as a plaque or add cup hooks or pegs to make a key rack, etc. Option - We have added clockworks to the back and numbers to the body to create a nice Country Clock. 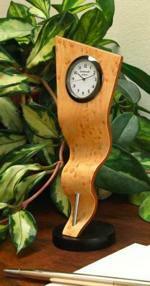 This clock scrollsaw pattern makes a striking finished piece. The designer has included step-by-step instructions and color photos to help you complete your clock project. The finished dimensions of the Rose Clock are 12 inches high by 12 inches wide and consists of 44 pieces. Build this whimsical eye-pleasing veneer Ribbon Clock from leftover pieces of veneer. Finished clock measures just over 8 inches tall. 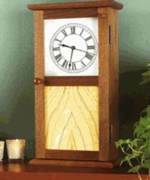 We will provide you with a source for the clock and stainless rod, and also for the veneer. These clocks are fun to make and give as gifts. 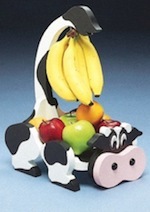 They are battery operated and the pattern contains traceable pieces. The clocks measure 8, 12, and 16 inches tall. This is a vintage woodworking plan. Visit our FAQ page for a full definition. View the Larger Image Slideshow to see the actual item you are buying. Boy scouts and other outdoor folks have made this curious device for many decades. They rubbed a stick over a larger notched stick to spin a twig nailed in the front. Ours uses dowels and a propeller. But what many do not know is while the notches are rubbed, the propeller can spin either direction without detection. Bystanders can ask yes questions (clockwise) or no questions (counterclockwise) for an answer and not know how the propeller knows. The secret technique comes with the plan. Download the pattern for this snail mini clock and get to work on your scroll saw right away. Link Type: free plans | Link Source: Arpop | Visit the category | Fix Link? 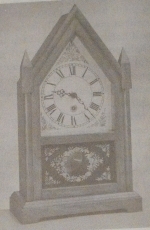 The plan says: Here is a beautifully styled steeple clock similar to that most graceful style of clock created in America in late 1843 and produced in large numbers through 1860. The sharp Gothic case designed by Chauncey Jerome is one of a few truely American designs and is still being manufactured today. Our clock is a simplified version - easy for even an inexperienced craftsman to build and take pride in the results. The plan says: Easy and inexpensive-to-build is a hard-to-beat combination, particularly when you end up with a beautiful O G Clock like the one pictured here. It is styled like those built by E.N. 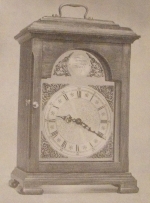 Welch, New Haven Clock Co. and Seth Thomas in the latter part of the 19th century, and its name is derived from the O G molding used for the frame. We built our model of pine and applied a dark walnut stain, which we rubbed down to look like the ld pine color and finished it with a fine furniture finish. An inexpensive pendulum movement and square dial were installed. The colorful decal in the glass panel allows the brass pendulum bob to show through as it moves from side to side. You will have a beautiful, functional piece of furniture for a fraction of this clock would retail for, and you will probably find yourself building more for gifts when your friends express their admiration. This pattern contains step by step instructions for building it. Also included are instructions and details for making a shelf particularly designed for this clock. The plan says: The classic clean lines of this solid ash or cherry wall clock add elegance to any home decor. Precision cut moldings, fluted columns with overlays and beveled glass beautifully frame these special pieces. This Indian Style Clock scrollsaw pattern makes a beautiful finished intarsia piece. 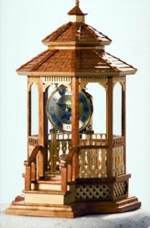 The clock consists of 116 pieces and measures approximately 14 inches wide and 14 inches high. Natures alarm clock! This Rooster scrollsaw pattern consists of 61 to 75 pieces depending on how detailed you wish your finished project to be. Dimensions are approximately 11 inches high by 13.5 inches wide. This is a vintage woodworking plan. 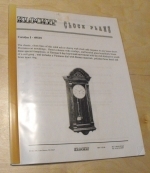 Fully detailed plans over 2 large pages to build a beautiful bracket clock. Visit our FAQ page for a full definition. View the Larger Image Slideshow to see the actual item you are buying. This original pattern includes full instructions for making this simple yet elegant mantle clock using your scroll saw and router. 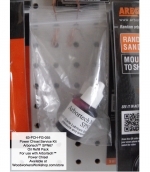 The clock uses a 3.5 inch kit which is available at most craft suppliers. 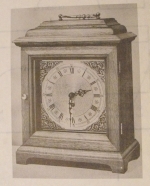 The clock pictured is made from pine, and mahogany was used for the overlay pieces. Here is a Vespa Mini Clock pattern for you to download and cut on the scroll saw. This is a vintage woodworking plan, materials list included. The plan provides source for instrument hardware but that company is no longer in business. Use the information to source your own clock parts. Visit our FAQ page for a full definition. View the Larger Image Slideshow to see the actual item you are buying. This free downloadable pattern includes 5 different patterns for micro-mini desk clocks. Features patterns for a squirrel clock, a bear, a pig and two dogs. Down load this free pattern and use your scroll saw to cut out the pieces. Makes a great layered wall mounted clock.